As much as I don't ever see myself driving a vehicle painted in such a bright color - way too attention-getting - I admire folks who do. I imagine it takes a certain kind of whimsy to decide you're going to park one of these things out front for the next bunch of years, and I wish I had a little more of whatever makes them tick embedded in my own DNA. Until my genetic code gets rewritten, I'll admire their wheels from afar. Or, in this case, up-close. 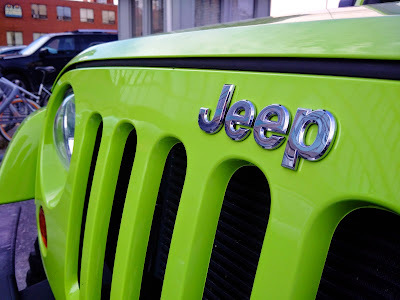 I caught this lovely example of a Jeep Wrangler on my way back to the office from an early interview, and secretly thanked whoever drives it for giving the rest of us an extra, colorful reason to smile. Your turn: Most modern cars are painted in colors that are too boring for words. Agree? Disagree? Please discuss. The spice of life often comes from your wild and expressive vehicle, or so we say, and drive, but then when you have your own private body shop why not! I don't mind being in my boring silver Honda. I would buy a brightly coloured car in a flash, but it costs more. Most well priced second hand cars in New Zealand are imported from Japan, and seem to be in the same boring colours. Mine is silver like about half the other cars in the supermarket parking lot(it's a pain when I'm trying to remember where I parked!). It would have cost me a few thousand dollars more to get one in a nice colour, so I didn't.